Could this possibly be Titian? A lovely vase with flutes and swags around the top. Can vaguely make out 4 numbers on the base. Hopefully 2085, but too feint to see any dots or not! Does it ring any bells Shazz? Re: Could this possibly be Titian? Hiya Haze - I think thats a Titian/Crown Lynn period vase - 2085 as I hae that one too. collectiques wrote: Hiya Haze - I think thats a Titian/Crown Lynn period vase - 2085 as I hae that one too. I did have a quick browse before I posted, but only a quick scoot for the number eg 1-199 etc. and didn't look at the photos. Just saw there wasn't four digits and checked the Titian!!! I shall have to go back and look at the photos!!!! Thanks heaps. You must see shape numbers in your sleep Just found it thanks Jo when your email popped through. That'll teach me to look! Does the 4 digit numbers mean that the same shape was reproduced later with a 3 digit number; or was the 4 digit the earlier one? Either way, what would be the dates please? Thought I might have had a wee 'find', but....!! Common as muck I also picked up another one which looks like a big shallow 'trophy cup' with fine handles, but unfortunately, its Beswick! I think you were right Hazedaze. This was a Titian mould that seems to have been transfered to CL when Titian became a subsidiary in 1967 or after. The shape is similar to the CL # 673, but that one was quite a bit smaller than the Titian one. If you put the pics side by side you can see the moulding differences too, esp. the rim decoration. I can't make out the numbers on the ones here unfortunately. The Titian number looks like it was 'something 106'. It is one of the larger Titian vases. Thanks Titian for clarifying this. Really appreciated. yep you're quite right - should have read the measurements the 2085 doesn't have a transfer note (which they did on many of the mould transfers) and is 6 3/4 inches high called 'fluted bowl"
Gosh Jo. I don't think they realised how complicated they were going to make things for everyone! Instead of bringing out the 'exact' same vase with a new number, why didn't they just modify the pattern a bit, say with a 'bobble' or two between some of the top flutes to make it a bit easier!!!?? Ahh! I see. Just to let you know 'I don't do complicated' Jo. I shall leave that for you knowledgeable guys to help me out. hazedaze wrote: Ahh! I see. Just to let you know 'I don't do complicated' Jo. I shall leave that for you knowledgeable guys to help me out. My statement was a bit vague wasn't it! Sorry. That's what I really meant Jo, was that it's looking great just now. Can't imagine how it can be improved upon, but can't wait to see. Before these current changes, (and after I changed from Dinasaur dialup to broadband), it still took quite some time to download the shape guide almost thumbnail by thumbnail; but now....it's ACE. 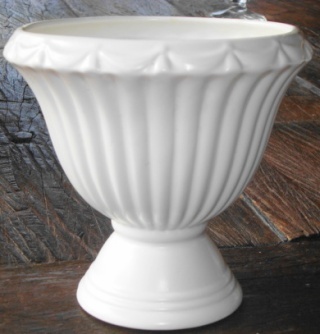 collectiques wrote: the 2085 doesn't have a transfer note (which they did on many of the mould transfers) and is 6 3/4 inches high called 'fluted bowl"
Any idea how many of the later shapes the notes record as transfered Titian moulds? an example : "1185 Air NZ Maori pattern ashtray (" " ) .....(sic).........14.8.73"